UPDATE: Success! The City Council has recommended that the signage and sharrows be installed, along with an evaluation of their effectiveness. Thank you for your support! 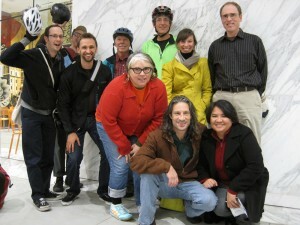 WeHo Bike Coalition members & supporters, giddy from just having spoken at a City Council meeting. The West Hollywood City Council will be considering improvements to Fountain Ave at their meeting on Tuesday, September 4th. We need to demonstrate a groundswell of support for sharrows and signage! Fortunately, that’s easy to do. You can attend the meeting and deliver public comment, or you can simply send an email of support. Use the text below to construct a 4-part letter/comment. Pick the option that you like best from each section, copy the text into a letter, and email it to CCouncil@weho.org or fax it to 323-848-6563. And if you can, please attend the City Council meeting on September 4th and read your letter during public comment. I am writing to strongly support the proposed sharrows and signage on Fountain Avenue. I’m a frequent user of Fountain Ave, and I know first-hand that the proposed improvements would make the street easier to use. Instead of changing the function or engineering of the street, these changes would simply clarify how drivers and bikes can safely and legally co-exist. In addition, these upgrades would match the existing markings that already exist on Fountain outside of West Hollywood. I make a deliberate choice to avoid Fountain Ave because its current configuration is simply too confusing and dangerous. Confusion over how drivers and bicyclists should share the road leads to unpredictable and hazardous condition. These upgrades would clarify how drivers and bikes and safely and legally co-exist. In addition, these upgrades would match the existing markings that already exist on Fountain outside of West Hollywood. Although Fountain is a convenient through-way for commuters, it’s currently very difficult for bikes and pedestrians to use this street. I strongly believe that our streets should accommodate all users fairly. I own both a car and a bike, but I rely on the car as my primary mode of transportation. If West Hollywood could offer safer, more comfortable bike infrastructure, I would be far more likely to bike to my destination instead of driving, thereby reducing congestion on the road and in parking spaces. I own both a car and a bike, and I rely on the bike as my primary mode of transportation. If West Hollywood could offer safer, more comfortable bike infrastructure, I would be far more likely to bike to my destination instead of driving, thereby reducing congestion on the road and in parking spaces. My sole mode of transportation is my car, but I would very much like to be able to use a bike to get around my neighborhood. If West Hollywood could offer safer, more comfortable bike infrastructure, I would be far more likely to bike to my destination instead of driving, thereby reducing congestion on the road and in parking spaces. My sole mode of transportation is my bike, so it’s very important to me that West Hollywood offer safe, comfortable bike infrastructure so that I’m able to get to destinations around town. For me, supporting bicycling in West Hollywood is a matter of public health. Because we rely so heavily on cars, Los Angeles ranks #1 in the nation for daily emissions of Nitrogen Oxides and Volatile Organic Compounds that are correlated with health problems. But it doesn’t have to be this way: A study by the University of Wisconsin showed that if residents did half of their short errands by bike, the region would save 1,100 lives and $7 billion in healthcare. For me, supporting bicycling in West Hollywood is a matter of reducing congestion. In Sydney, the bike network is estimated to eliminate 4.3 million vehicle trips every year. And studies show that free parking and parking subsidies increase driving rates by 20% to 40%. For me, supporting bicycling in West Hollywood is a matter of good business. 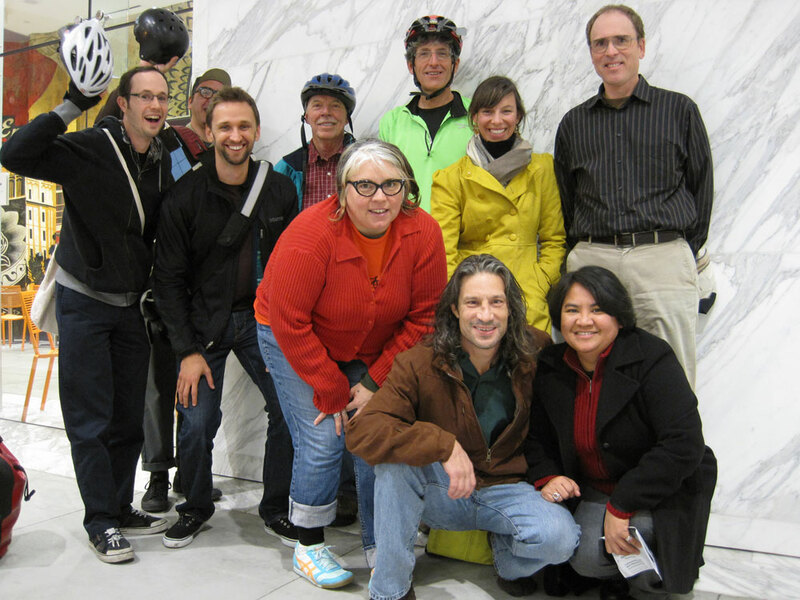 Events like CicLAvia improve business as much as 20%, even after the event is over. A Portland study shows that bicyclists spend more money per month, and visit businesses more often, than customers on any other mode of transit. For me, supporting bicycling in West Hollywood is a matter of supporting strong neighborhoods. 78% of real estate agents report that their clients are looking for neighborhoods that reduce the amount they have to spend on gas. And in one study, homes sold for 11% when they were close to bicycle infrastructure. For me, supporting bicycling in West Hollywood is a matter of economics. Caltrans reported half a million car crashes in California in 2008, costing an estimated $528 billion in lost lives, property, and productivity. And bike infrastructure is highly cost-effective: in 2009, a repaving project on the 710 cost $25 million per mile, but bike lanes cost as little as $5,000 per mile. At the University of Utah, cyclists reduced the school’s car-parking needs by over 500 spaces, saving them from having to build a $3.5 million garage. For me, supporting bicycling in West Hollywood is a matter of keeping pace with surrounding municipalities. The City of LA has a bike plan calling for 1,680 new miles of bikeways. Santa Monica has a brand new world-class bike facility. Porter Ranch is installing buffered bike lanes. The new Warner Center plans call for more bike paths. USC is adding new bike lanes. There are 130 new miles of bike paths in Long Beach. Glendale just approved a plan for 40 new miles of bike lanes. For me, supporting bicycling in West Hollywood is a matter of meeting demand. Cycling in Los Angeles increased 32% from 2009 to 2011. Biking to work increased 43% from 2001 to 2009. New downtown bike lanes on Spring Street increased cycling by 52% — and by 250% on weekends. Meanwhile, car usage at UCLA is at its lowest point in two decades. For me, supporting bicycling in West Hollywood is a matter of safety. Bicycle regulations change from city to city, so drivers and cyclist often have to guess how they should legally interact. That confusion is dangerous: 14% of traffic fatalities are bicyclists or pedestrians, and 64% of bicyclist deaths occur at non-intersections. The elderly are particularly at risk: the rate of pedestrian deaths is 61% higher for people 70 and older. About 15% of senior citizens have started biking more to save money on gas, but an AARP survey shows that just 40% of respondents felt their neighborhood has enough bike accommodations. It doesn’t have to be this way: when Austin installed sharrows and bike boxes, the rate of drivers yielding to bikes doubled. Bike lanes in Columbus reduced crashes by 34%, and 73% of residents said it improved the street. When streets are made “complete” for all modes of transit, there’s a 34% reduction in crashes and a 68% reduction in injuries. Although I do support the proposed signage, I’d like to suggest an even better option: the phrase “Share the Road” is a little confusing. It’s unclear whether that means that drivers should travel side-by-side within the lane next to cyclists, or should change lanes to pass. I’d rather the city install signs reading “Bikes may use full lane” so there isn’t any doubt. Although I support the “Share the Road” signs, I would prefer that the city use signs that say “May Use Full Lane” instead, since that is the wording approved by the California Manual of Uniform Traffic Control Devices. Although I do support the “Share the Road” signs, I feel that that there is a better alternative. According to the LA DOT, city of Los Angeles is about to begin putting up signs on their portion of Fountain Ave that say “Bikes May Use Full Lane.” This is much clearer phrasing, and vastly preferable. In the [number] years I’ve [lived in/visited] West Hollywood, I’ve seen the community immeasurably improved whenever we facilitate the safe sharing of the road by all users. I’m very excited to see that the city is committed to clarifying how drivers and bicyclists should co-exist on Fountain, and I look forward to many other such projects in the future.